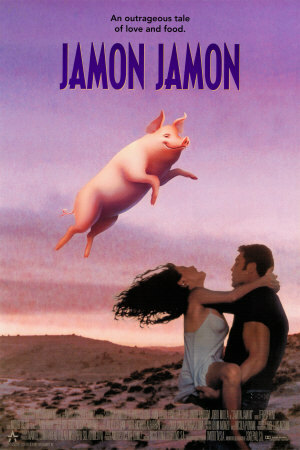 Penelope Cruz’s “break-out” film was a lusty, comedic tale called Jamon, Jamon in which one of her suitors tells her that her breasts taste like serrano ham. Throughout the film (in which Cruz frequently appears partially clothed) there are many shots of legs of jamon serrano and iberico hanging in store windows, and the film climaxes with Cruz’s two suitors (one of whom is played by Javier Bardem – recent winner of the best actor award from the Screen Actor’s Guild) attacking each other with hefty pork legs. The film was shot in the dry, scrubby hills surrounding Zaragoza and a lot of the landscape shots include a large metal bull (the Osborne sherry insignia) sitting among a forest of radio and TV antennae – a view that is quite common in Spain. In one scene, Cruz’s other suitor, a wannabe bullfighter swings from the bulls cojones and accidentally pulls them off, castrating the beast. The sexual meaning of this is, of course, implicit in the movie, but being someone who marvels more at the wonder of pork products than at the chemistry of on-screen lovers, I find the dual motifs of ham and bulls very interesting. You see, bull bumper stickers are found throughout Spain and the meaning is linked to Spanish culturalism (yes, including, bullfighting) and, in a country with several semi-independent regions, centralism under Madrid. In Catalunya, you often see donkey bumper stickers, as a statement of Catalan identity — the humble donkey being the symbol of that region. Anyway, if the bull is the “official” emblem of Spain, then the unofficial emblem should be the ham, for nowhere else I have ever been holds that cut of meat in higher esteem. I mean, quite apart from naming an award-winning movie after it, the Spanish are quite literally mad for their ham. 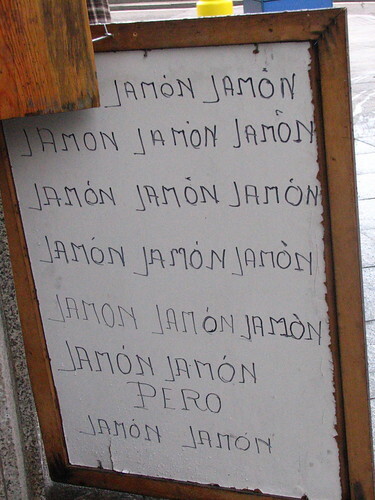 In Madrid, for example, there are several Museos de Jamon, which aren’t exactly museums — they’re shops — but the idea is that ham is of such great importance to the people that such a store name isn’t overblown in the slightest. As far as I am concerned, they are right to love it so. For me, there are very few things in life as delicious as a racione of cured Iberian ham (jamon iberico) split between as few people as possible. The taste is almost indescribably good. It is unquestionably porky, but in an intense, almost gamey way, and the fat, oh the fat, is well, like acorn flavored pork butter, if that even conveys anything. 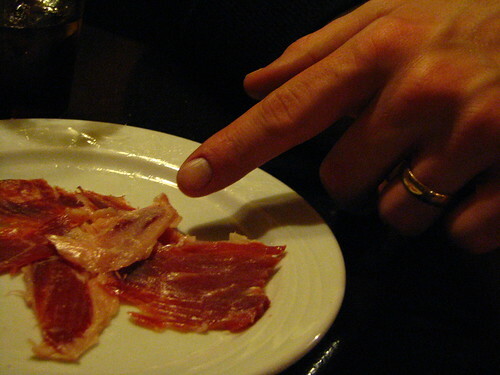 If not, rest assured that jamon iberico (or the lower grade, but still exceedingly delicious, jamon serrano) tastes absolutely nothing like the boiled, sugar-coated, artificially-preserved, ready circle-cut ham legs sold in the US. Whereas US hogs are factory farmed in the backwaters of Tennessee in giant filthy sheds and the run-off from the pig-sties pollutes local rivers, the Spanish hogs are a noble, almost-wild breed of pig that are nearly as famous for their intelligence as their tasty limbs. Fed primarily (though not exclusively, depending on the producer) on acorns, Iberian black-footed pigs (yes, they leave the trotter on the leg so you tell) come from the region of Extremadura bordering Portugal in the central west of Spain, and are allowed to roam freely around under the same cork oaks that have for centuries produced the stoppers for European wine-bottles. It would not be wrong, I don’t think, to compare jamon iberico to other world-famous delicacies like kobe beef (waygu) or beluga caviar or the famed blue-footed chickens of Bresse, France, because it is simply beyond compare. And yes, I ate plenty of prosciutto di Parma and prosciutto San Daniele last year in Italy, and while they are very, very good, jamon iberico is just a richer, more intense, less salty experience. For more on the pigs that produce this delicacy, click here. If you understand Spanish, then you should check out this YouTube video, which demonstrates the correct way to prepare a platter of delicious jamon. And, by clicking the first link, you’ll be heading to La Tienda who now import bone-in legs of jamon to the US for your delectation. We’re saving our pennies hard right now for a whole leg. We brought several kilos of serrano and iberico ham back with us from Spain a couple of years ago (from El Museo de Jamon, no less). We were heartbroken when Customs confiscated it. I was furious when I learned this spring, in preparation for another trip to Spain, that you are allowed to bring in Spanish ham for personal use and that ours never should have been taken from us. I’m almost 100% sure that is a new-ish rule. The US just started allowing us to purchase legs of jamon to sell in specialty shops w/in the last 6 to 9 months. 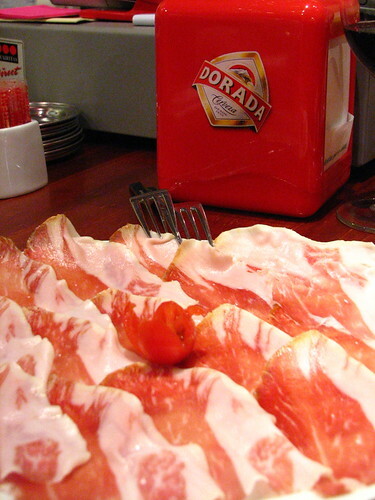 You’ll even notice now in the airports you can buy shrink-wrapped slices of jamon. In fact, a fellow blogger just sent us a package through the mail w/ all sorts of meaty goodies. i was scared shitless it would be confiscated but, w/ the new rules, it wasn’t. btw, i can’t be your friend – you’re going to spain!!!!!!!!!!!!! can i fit in your luggage? This is happening in Australia too. We have just been allowed to import Jamon. On that Note, you can buy Jamon here.